For that (and other) reasons, lots of people remodel their RVs. Some take on a different RV renovation project each year. Others tackle it all at once with a complete RV overhaul. I’ve actually done one of each! Generally, the idea is to modernize outdated furnishings and optimize the placement of things inside your RV — to give it a more cozy, updated look and feel. I don’t know what it is, but ever since I remodeled our first RV, my wife has approached the subject of redecorating with a no-holds-barred attitude. With 2 successful RV makeovers under my belt, my wife now thinks I can make a silk purse out of any old sow’s ear when it comes to making an old RV come to life! 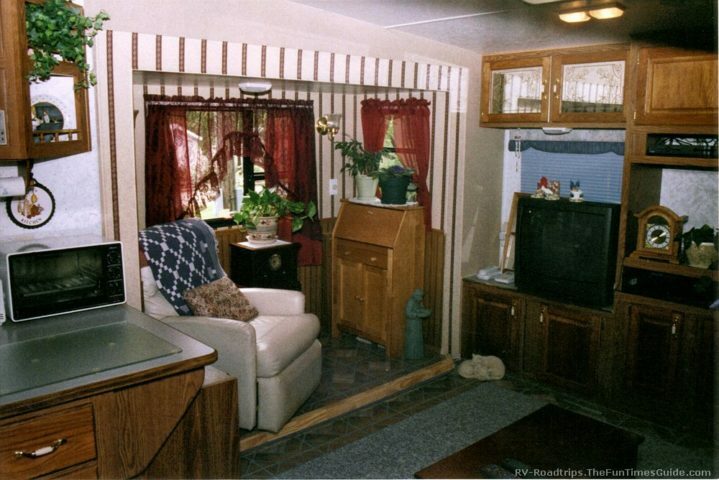 Our first RV project was a 10-year-old Prowler 25-foot fifth wheel trailer. It had seen a hard life, but we bought it cheap enough and wanted to make a good vacation RV out of it. First, we replaced the dinette table. The very first thing to go was the dinette. My wife and I have a particular dislike for RV dinettes. Since there are only 2 of us, dinettes take up way too much space inside the RV. Plus, as you get older, it becomes more difficult to get in and out of those dinette seats — which are so confining! A simple small round table and 2 chairs works well inside the RV, and it looks a lot better too. For the table, we picked a pine table top from Home Depot, and the familiar metal tube table legs from Camping World. After a few coats of polyurethane, we had an RV table that could still be easily removed. Best of all, our new dinette table gave us even more space in our small RV living room! 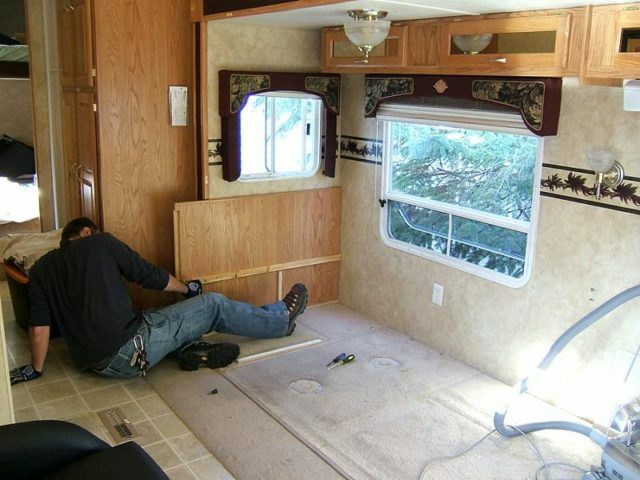 Here are my tips to help you decide… should you repair or should you replace RV furniture? Then, we replaced the carpet. The next step was to replace the badly worn and faded blue carpet throughout the RV. A vacation rig doesn’t need carpeting — because carpet just collects dirt. And before long, RV carpet will look just like what we had: dirty carpet! I’m a firm believer in a floor that can be swept out. If you have kids (or pets, as we do), this is the only way to go. RV rugs can be taken outside and shaken, but carpet is harder to clean and will rapidly start to look nasty. So, out came the carpet. We installed peel and stick vinyl tile in its place. I must admit, the peel and stick vinyl was a mistake. It was fine in the summer — but when storing the RV through the colder months, some of the tiles came loose and had to be replaced. RVers share some mistakes to avoid when installing peel & stick vinyl flooring. It would be well worth the extra effort to put in 1-piece vinyl flooring when you’re upgrading the floor inside your RV. Better yet, installing laminate wood flooring would add a touch of class to the space. With today’s snap-together laminates, it’s a simple and cost-effective way to get rid of old RV carpet! Finally, we replaced the window treatments. With some new RV curtains on all the windows, our mini-makeover was complete. Our old RV trailer was freshened up and looking like new again! Paper shades are another popular option for RV window treatments. Through Camping World’s website, you can create custom day/night RV window shades. Here’s a great tutorial for replacing RV windshield curtains with roller shades. Our second RV renovation project was quite a bit more extensive — though still within the abilities of the average person who isn’t afraid to get their hands dirty. 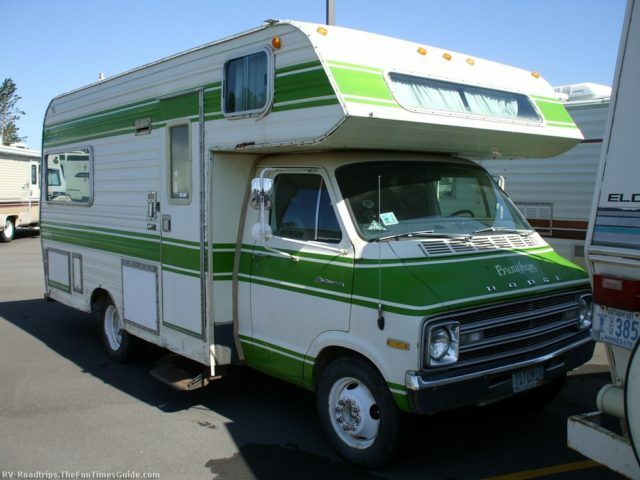 See the top 10 common RV repairs that the average do-it-yourselfer can easily complete. After some time off from fulltime RVing, we later decided to get back on the road again and leave Texas. We gave up our apartment and quickly moved into a secondhand 36-foot triple slide 5th wheel trailer. It was the layout we wanted. It was less than half the price of what a new RV would have cost. We moved into it just as it was. We approached this RV remodel a bit differently. Since we knew that we would be living in this RV for at least a couple years, we wanted it to feel like a home. Only couples who get along very well together should attempt what we did next…. I immediately started a top-to-bottom rebuild while we lived in this small space! This ended up being a pretty good-sized RV renovation project… to say the least. First, we had a sizeable repair to take care of. There was some structural water damage that required gutting one of the slideouts, adding new wall studs, adding a new sub-floor, adding insulation, and doing away with one window. Once it was sound, we started putting our RV interior remodeling ideas into place. We removed the dinette, as well as the fold-out sofa. Actually. we emptied the 2 living room slideouts of everything that was permanently mounted, and we approached that part of the RV as an entirely empty room! Wainscoting panels were installed, and the upper portion of the walls were painted on one side of the room. Wallpaper was installed on the accent walls. We finished off the look with new wood trim around the slideouts and some lace curtains for the windows. Next campe the RV flooring. We installed new carpet in the living room, and we installed vinyl flooring in the kitchen portion of our newly remodeled home. My wife wanted to be able to move the RV furniture around — in order to give our residence a fresh look every now and then. So we actually treated this RV like an apartment, and we bought all new furniture — including a small sofa, recliner, kitchen set for two. 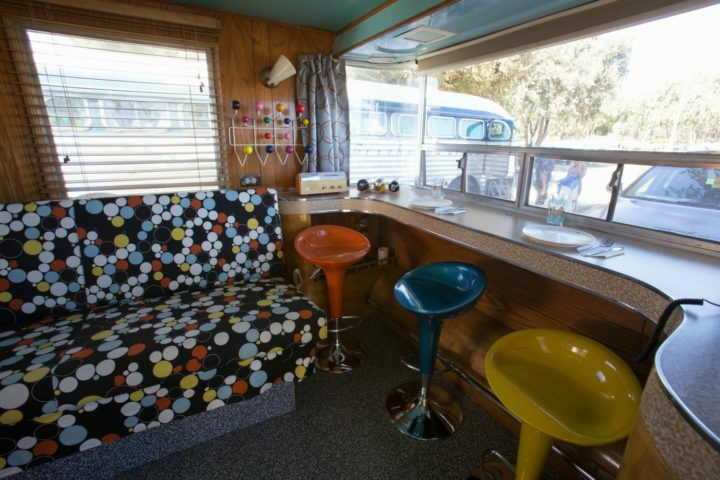 Having all of the new things inside a freshly remodeled RV really brightened up the place. Here are my tips for replacing RV furniture, plus a few of my favorite videos showing you how to do it. 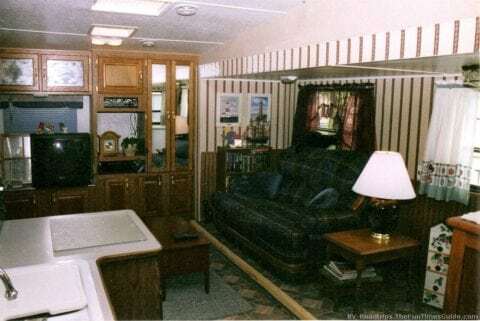 When we finally made the move north (with the walls slid in and things placed for travel), we had no issues with the fact that the RV furniture wasn’t bolted down to the floor. Everything stayed in place just fine. And without all the built-in stuff taking up valuable space inside the RV, we were also able to add a small chest freezer for additional frozen food storage. A freezer is a great RV add-on if you’re going to be stationary for long periods of time. At the RV park, we also fixed up our RV parking spot pretty nice too. We stayed there 2 years — during which time we built a deck, planted flowers, and we even built a swing. 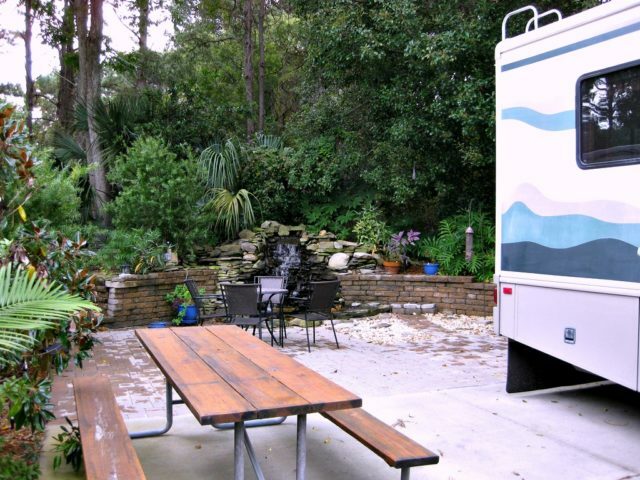 In fact, the RV park was pleased that we left all of those things behind when we moved on. After these 2 major RV renovation experiences, my wife now looks at everything with an eye for change. An interior decorator at heart, it doesn’t matter where we are… she always wants to tear something out and do it different. So, would I do another RV makeover again? Absolutely! 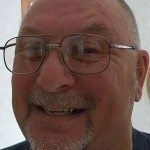 It’s the best way I know to save and possibly even make money on an RV purchase. Besides, it gives your RV the feeling of home that just can’t be obtained from the factory. Don’t want to remodel your RV yourself? If you’re not particularly handy with do-it-yourself projects, or you just don’t have the time or space to do the RV renovation yourself, then leave it to the professionals do it! RV Decor – See a gallery of their work. Vintage Restorations – See some examples. Timeless Travel Trailers – See their portfolio. RV Camping World Collision Repair Services – Don’t let the name throw you… they provide interior & exterior design solutions, too.